If you are confused in choosing between Panasonic HC-WXF991K and Sony FDR-AX53, don’t worry! You are not alone. 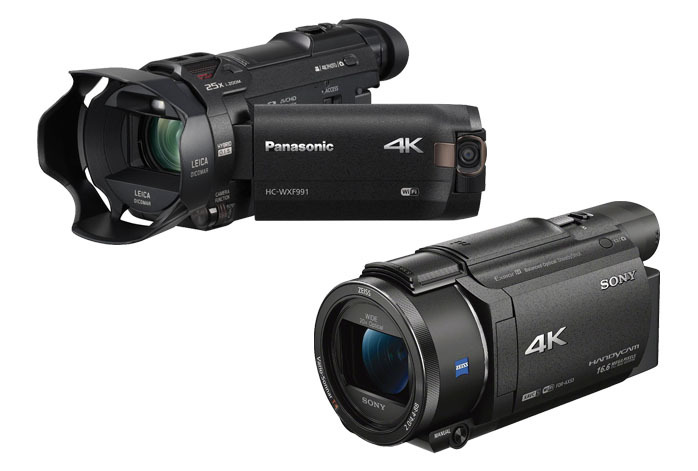 There are a lot of people who can’t decide between these two models, since both are attractive and budget-friendly 4K Ultra HD camcorders. They are excellent choices for the more casual purposes, such as for personal documentary or family usage. These two models are also available in a similar price range. Below, we will take a look at each model in order to determine which one to choose. Panasonic HC-WXF991K is quite a powerful camcorder, coming armed with an 18.91 MP 1/2.3” MOS image sensor and a LEICA Decoma lens that is able to provide up to 20X optical zoom and 25X 4K Intelligent Zoom. It is able to record 4K Ultra HD videos with 30 fps frame rate in 72 Mbps quality (MP4 format). It can also record into AVCHD and iFrame formats. The colors of the images are nice and full, also with decent sharpness and details. Furthermore, Panasonic HC-WXF991K also boasts a five-axis hybrid optical image stabilization, ensuring for optimum crisp and clarity in every footage. In addition, it also offers in-camera effects and editing, plus an electronic viewfinder (EVF) for a semi-professional experience. There is built-in Wi-Fi for easy file sharing. On the other hand, Sony FDR-AX53 boasts a 16.6 MP 1/2.5”Exmor R sensor with Balanced Optical SteadyShot image stabilization and Intelligent Active Mode. The system allows the entire optical block to move at once in order to maintain the integrity of the optical path and reduce shake and distortion. It has been improved to provide five-axis stabilization from wide angle to telephoto, too. Furthermore, Sony FDR-AX53 also boasts the Fast Intelligent AF system for incredibly rapid and precise contrast detection. The 26.8 mm ZEISS lens offers 20X maximum optical zoom and 30X maximum 4K Clear Image Zoom. It can record 4K Ultra HD footage in up to 100 Mbps XAVC S format, also AVCHD and MP4 formats. Sony FDR-AX53 also comes with built-in EVF, Wi-Fi, and NFC. Last but not least, it offers a broad compatibility with various recording media, including Memory Stick PRO-HG Duo, Memory Stick Pro Duo (Mark 2), Memory Stick XC-HG Duo, and SD/SDHC/SDXC cards. Due to the higher zooming power, better digital quality, and wider compatibility with various recording media, we recommend you to choose Sony FDR-AX53!